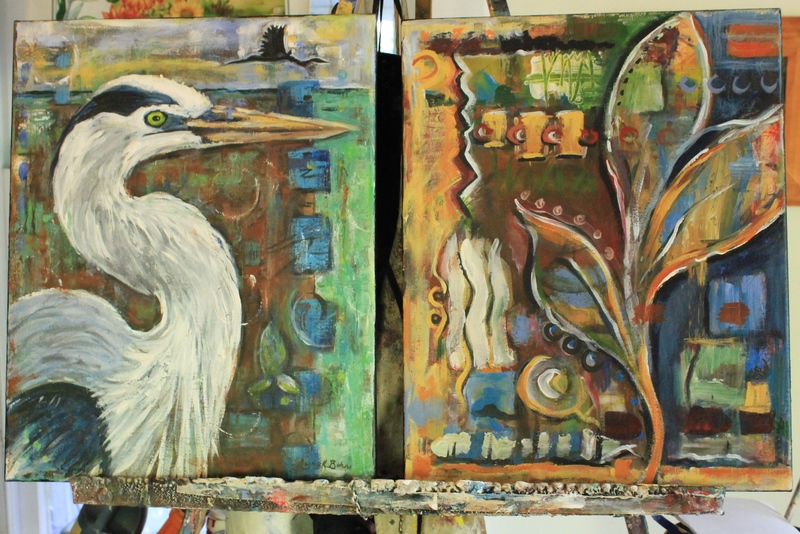 I recently finished both of these 16 x 20 acrylic paintings and then put them side by side on the easel. My recent work of painting of layers has come to represent a stylized look that I didn’t realize until finished. Working in layers of exploratory abstract paint while adding and subtracting some of the layers is a process of discovery. Any of you artists out there have experimental works underway and end up with a new style? i like the finished work. i’m doing some experimental work (experimental for me, at least). some of them are never completed (self doubt overwhelms sometimes). but some i have completed and enjoyed and some i’m working on right now are going well. the enjoyment, like with you, is being able to combine several different styles, concepts and ideas into one piece, adding and subtracting as you said, making one complex whole. all the best with your continued work! Yes, I understand as I have many paintings stacked and unfinished. One of my painting teachers told me that he has a 1 in 5 average of successful paintings. So that sort of takes the pressure off to know that. Also, painting more than one painting at once helps take pressure off worrying about the finished product. Really it is about the process and how it helps you, at least that is what I learned in art therapy. Having studying both fine art and art therapy I prefer to focus on the process not the product but if I see it turning out well then I make a conscious decision to finalize the product and make it look good. If it stinks I just keep adding layers and have fun and keep going or do the entire thing over! Have fun and hope you try working on more than one at a time! It is very freeing. thanks for yo word, thanks for the reminder!! You are welcome! That is why working on more than one at a time helps me. I still pressure myself but it is less knowing that some works can just be experiments.